Gal Garner is incredibly set in her ways: she goes to school; goes to dialysis; tends and breeds her roses – and Gal’s opinions are nearly as stuck as her routine, certainly she doesn’t approve of the life her sister leads or how she is raising her daughter Riley, Gal’s niece. When Riley shows up at Gal’s school unexpectedly with the news that she’s been sent to live with her while her mother takes a job in Asia, Gal’s pleasant, ordered life is suddenly messy and unpredictable. I loved Margaret Dilloway’s debut novel, How to be an American Housewife, so when I heard that she had a second book out I jumped at the chance to read it. The Care and Handling of Roses with Thorns does not disappoint. Gal is at times a difficult character to love – or even connect with – she is as prickly as the thorns on her roses. Even so, the way that Dilloway writes and develops her, Gal’s difficulty in truly connecting with others is completely understandable. You feel sympathy for her, even as you can see all the ways she is wrong or narrow-minded in the way she is viewing the world. Dilloway is fantastic at her craft: her writing flows beautifully, her characters are almost achingly real. 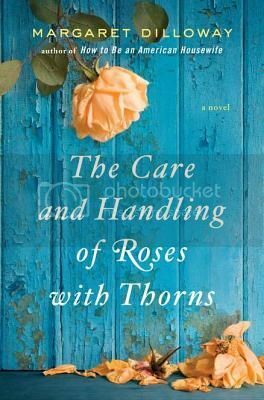 The Care and Handling of Roses with Thorns is a lovely book, and one I recommend. Sounds interesting. I love the cover. Thanks for sharing your thoughts. beautiful cover..what, I am shallow! Dilloway sounds like a talented author. Love the cover too. Oh, I know JUST who would love this book! Thank you for the review. I have yet to read American Housewife (which has been sitting on my shelf for WAY too long) but this one also looks fantastic. Thanks so much for your review, I am looking for some new books to end the summer with. Happy Reading!